J Chadwick Co’s Optical Micrometer is a portable inspection microscope for measuring the depth of scratches, corrosion pits, and flaws on critical components. Defect classification is a vital aspect of maintenance and NDT simply because repair-or-replace decisions have a profound effect on cost and safety. When surface damage is found, maintainers must determine if a component is within tolerance or must be replaced. The Optical Micrometer outperforms legacy methods including the pit gage and the “fingernail test” (complete gage R&R study and testimonials can be found on J Chadwick Co’s website at www.jchadwickco.com). 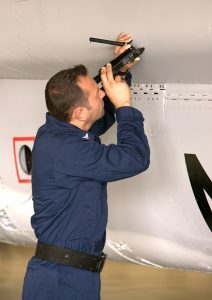 The subjective method of damage evaluation known as the “fingernail test”, which is used to determine scratch depth, is obviously inadequate; it relies heavily on guesswork and does not involve any traceable standards. Testimonials showed why other gages are generally not used on curved surfaces and do not produce reliable, repeatable results. These user opinions were validated by the gage R&R study. In addition to reducing the amount of guesswork, the Optical Micrometer can also enhance modern maintenance programs including CBM+, the “digital thread”, and more. For over 25 years the Optical Micrometer has been approved support equipment with NSN’s, GSA contract, and established calibration procedures. It is listed in Air Force and Navy TM’s titled “Aircraft Weapon System Cleaning and Corrosion” (TO 1-1-691 and NAVAIR 01-1A-509 respectively); in the Army in TB 43-180 – “CALIBRATION AND REPAIR REQUIREMENTS FOR THE MAINTENANCE OF ARMY MATERIAL” (T-Level); and “TMD Preferred Equipment List” for PM Apache. The Army recently concluded a comprehensive evaluation of the Optical Micrometer, including a review of the gage R&R studies, comparison to legacy methods, and end-user input/testimonials. 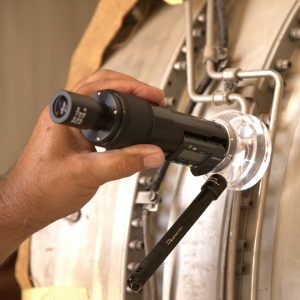 The result was a new requirement and placement of the Optical Micrometer in hundreds of Army Aviation Alpha 92 Toolsets (AVIM level). The army anticipates a significant reduction in maintenance labor hours and ownership cost, as well as improvements to safety and readiness. It is hoped that other branches within the DoD will take advantage of the same time and cost-saving benefits now required by the Army.